LCMS is a cloud-based or locally-hosted compliance management server for DO-178C/DO-278A and DO-254 applicants. - Does compliance with DO-178C, DO-278A or DO-254 create fear and anxiety in your organization? - Are you the company determined to get it right the first time at the lowest possible fixed cost? If so, then LDRA Compliance Management System (LCMS) is the right choice! What is LDRA Compliance Management System? Templates have been developed by Level A, Federal Aviation Agency (FAA) DER’s to oversee and easily link LCMS with your current development processes. They are definitive, FAA approved and compliant with European Aviation Safety Agency (EASA) Certification Memo requirements. Note that these templates are currently being used by the FAA as part of their official Aircraft Certification Engineer Training Course (as a "model" package). 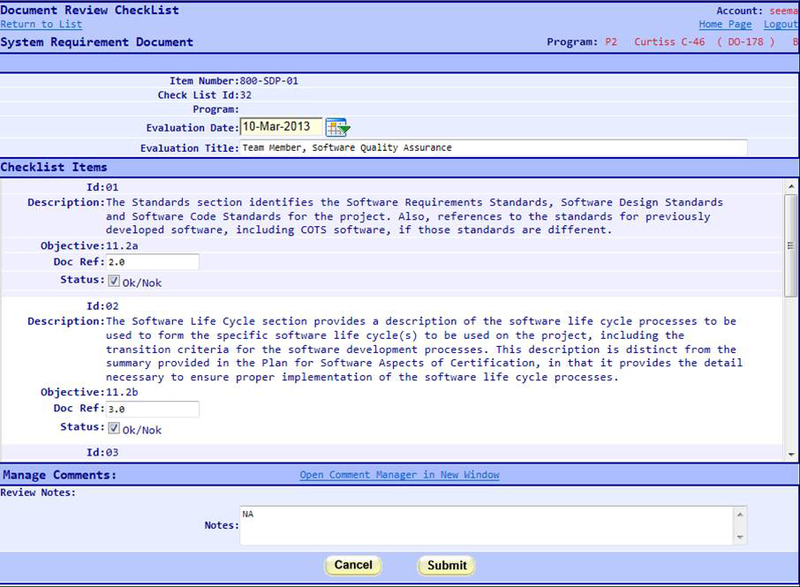 LCMS also offers checklists that are essential to ensuring process compliance and helping the applicant achieve the DO-178C/DO-254A and DO-254 Objectives. The checklists have been refined over the course of hundreds of successful projects and reflect the latest regulatory guidance. 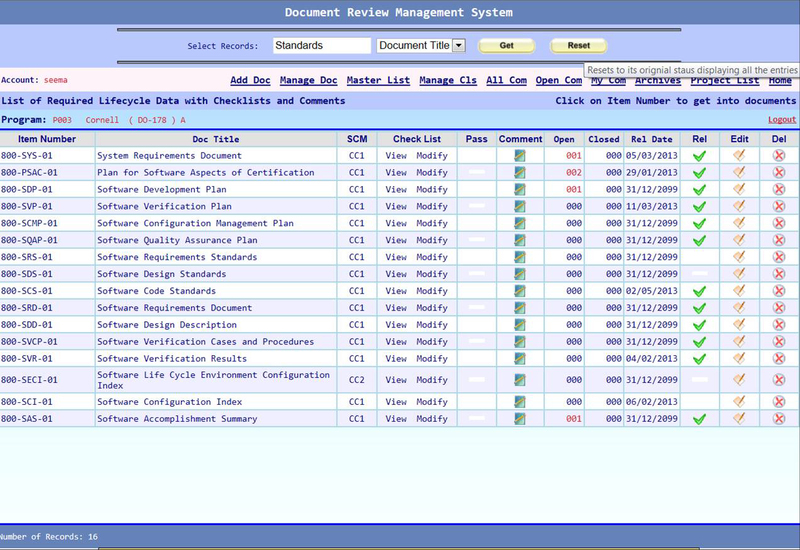 The checklists produce self-documenting compliance data with easy-entry windows for review comments. Combined with the detailed document templates, the electronic checklists (tailored to the applicable design assurance level) and supporting LCMS features, including problem reporting and tracking, make LCMS a world-class compliance management solution at the lowest possible fixed cost! LCMS - Cloud or Local? LCMS is offered on two scalable platforms, cloud and locally hosted servers. From a convenient and secure cloud server, LCMS Cloud users can manage the planning, development, verification and regulatory activities required on a DO-178C/DO-278A and DO-254 project. LCMS Local users utilize a locally hosted compliance management server for DO-178C/DO-278A and DO-254 projects. 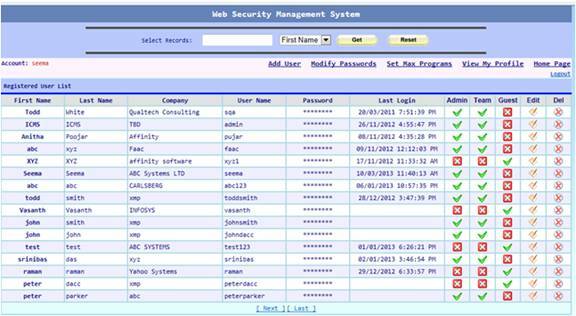 LCMS Local includes all the features of LCMS Cloud though it is installed inside the applicant’s firewall. LCMS Local can also be used with the LDRA tool suite (purchased separately) and/or third party tools. Both LCMS Cloud and LCMS Local include a two-day quick start training and LCS Level A DER on-going support to ensure full compliance to the standards.